YOU CAN LEARN TO PLAY the HARP! It is hard to believe that we are having our 20th Anniversary!! And how the Harp Movement has grown in the intervening years…! THE HIGH SPIRITS MUSIC RETREAT had its joyful beginnings in Chemainus on Vancouver Island in 1999, where Virginia & Larry Blatchford made us all welcome at their Birdsong Cottage Bed & Breakfast, and with hospitable friends all over town. 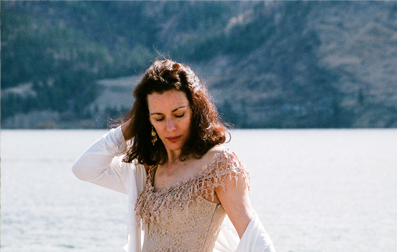 Join us in West Kelowna this Spring as we celebrate two decades of retreats, and hundreds of selections from Celtic, Latin and Classical repertoire, all selected for the INTERMEDIATE PLAYER. Sharlene’s teaching style is one of a kind: deep and experienced, sassy and fresh, optimistic and confident! Come and experience her in person, and return home invigorated to play better than ever! The Friday Night Concert will be ultimate “Shar in action”, and the Spellbound Harp Trio will join her in performance. Everything you need to REGISTER is there. Reserve your spot. 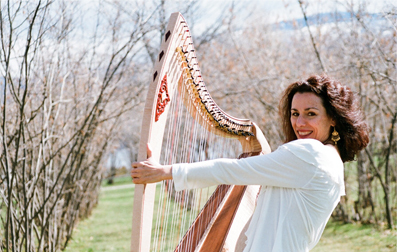 CAROLINE teaches Celtic HARP to Beginning and Intermediate students at the KELOWNA and VERNON Community Music Schools and the PENTICTON ACADEMY as well as working from her Home Studio in WEST KELOWNA. Private lessons are most effective for Beginners, while Performance Coaching, Arranging and Ensemble Direction are available for more advanced players. 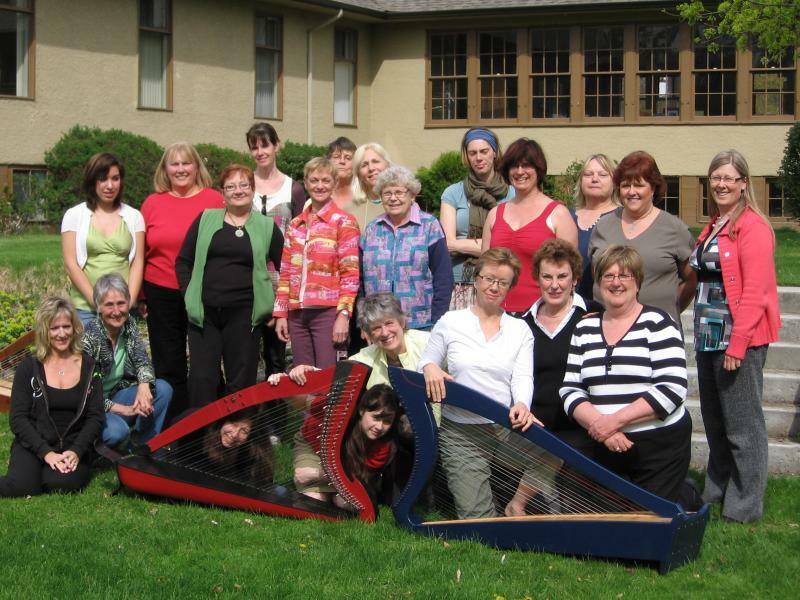 She also creates Annual Workshops for small groups, which are hosted in BC towns where there is a Circle of HARP players. 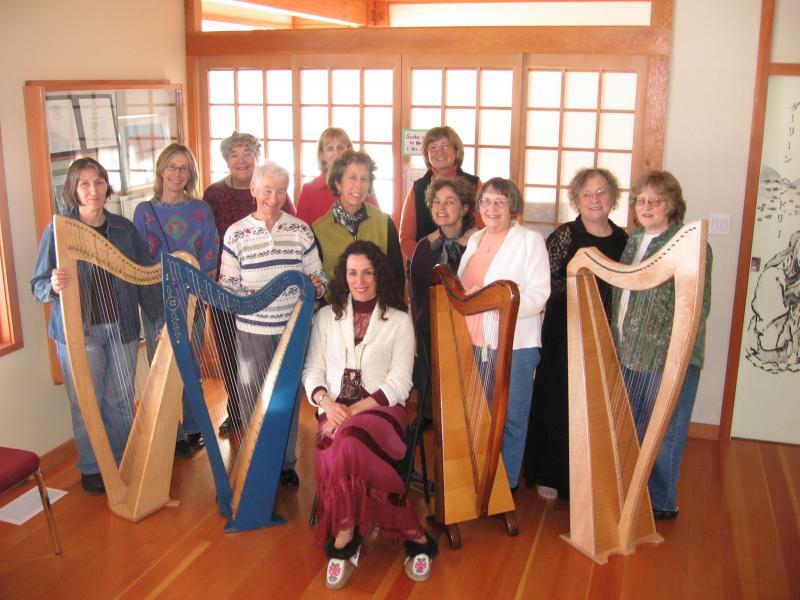 RENTAL HARPS are available through DIAMOND HARPS for those who wish to try out lessons without having to buy an instrument just yet. Husband Daniel Schmitt is the local Harp Builder, Artisan and Proprietor of Diamond Harps, an exclusively Canadian Company. 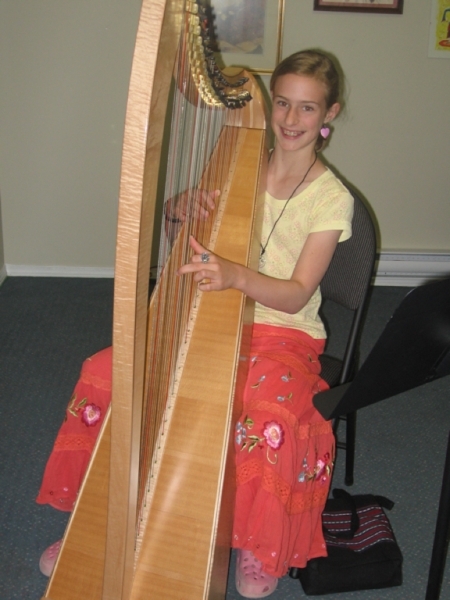 CAROLINE has developed MUSIC CURRICULUM especially for the Folk Harp student, with an emphasis on solid technique and relaxation. She specializes in Adult lessons, as well as Children and Teens. “Sound Advice” THEORY and EAR-TRAINING are components of her program and can be started at any level. See our BOOKS AND SHEET MUSIC page. Ensemble playing is encouraged, and everything from Duos and Trios to a large group Orchestra are making waves around the BC Interior. 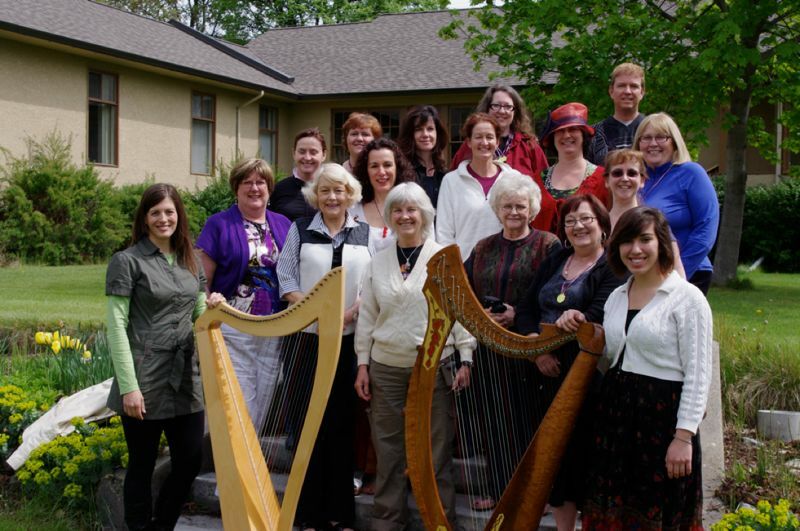 Every Spring, HIGH SPIRITS MUSIC plays host to a Celtic Harp Workshop. We started out on Vancouver Island in 1998, with KIM ROBERTSON, SHARLENE WALLACE, LAURA ZAERR and CAROLINE MACKAY teaching in the famous Chemainus Theatre in mid-February! In 2002, we moved the Workshop to NARAMATA on Lake Okanagan, and took advantage of the beautiful scenery and spring blossoms at the Retreat Centre. Since then, we have invited HARPER TASCHE, KERI LYNN ZWICKER, ALYS HOWE, REBECCA BLAIR, KIM ROBERTSON and SHARLENE WALLACE. We have not had a visit from the incredible harpist and master teacher SHARLENE WALLACE for several years, so High Spirits Music is delighted that we have been able to entice her to come to the Okanagan in early May! This will be an Intermediate Level Workshop in West Kelowna for a full day on Friday May 4, and a half day on Saturday May 5. Of course there will be a concert on the Friday night as well, for every level of harp player and fan to enjoy! On the concert program, Sharlene will be joined by AARON ORD, the Okanagan’s own flourishing Harp Talent! See the brochure below for all the details! And her most tasty Latin and Celtic pieces of the year! See the brochure and link below for a wonderful lineup of teachers and events. Check this out before you make your summer plans!! Not to be missed. IMAGINE THIS … The sound of a 6 piece Harp Ensemble… Now, include Vocals, Cello, and Flute, and dresses that sparkle! Current and former students of the Harp School create performances for a Winter Season and a Spring Season each year. 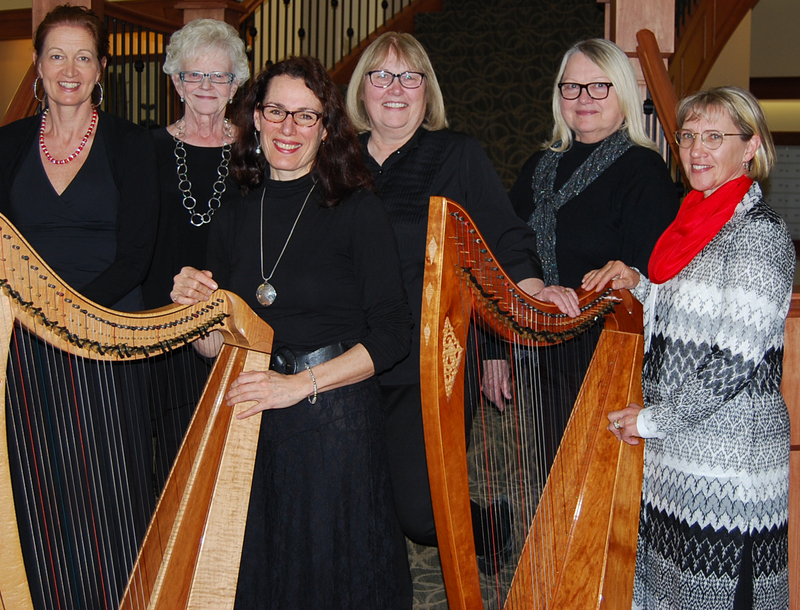 Under CAROLINE’S direction, the OKANAGAN HARP ORCHESTRA has a spicy repertoire and is a stunning visual display of Hand-crafted Harps as well. The audience is invited to come up and have a closer look at the instruments when the concert is finished. Every concert is different, as we are always arranging new selections, from rhythmic Latin, to Celtic, original and Classical pieces. View where we can be seen and heard on the CONCERT SCHEDULE page.